A package sent in 1960 from Albert Hoffmann of Sandoz Labs, containing one gram of powdered LSD, goes on to provide the first acid experiences for many in New York. A comic by Ethan Persoff and Scott Marshall. 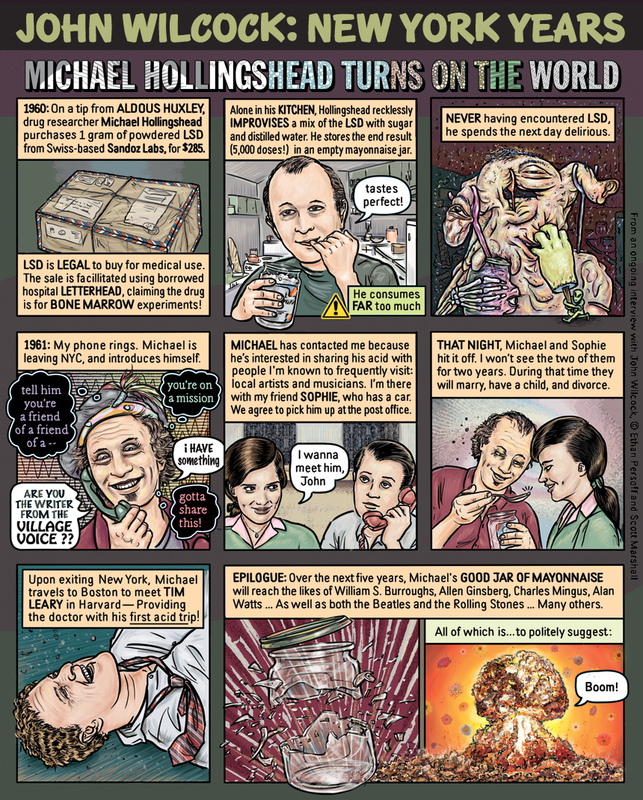 Read the entirety of Michael Hollingshead's autobiography THE MAN WHO TURNED ON THE WORLD at the Psychedelic Library. John Lennon's Song "Help!" - The Real First LSD-Oriented Beatles Song. Additional Item: Before being banned, LSD was emerging in research as one of the more effective treatments for alcoholism and other difficult habits. Read the recent article on hallucinogens as therapy, Scientists Study What Psychedelics Do to the Brain, and It's Not What You've Been Told. For a list of various experiences and LSD information, visit Erowid's LSD Vault. From an ongoing comic book biography of underground publisher John Wilcock's years in New York. View previous installments of the John Wilcock comic here and here. John Wilcock describes the circumstances behind his quitting The East Village Other over their review of Andy Warhol’s 1966 film Chelsea Girls.